Korea Tourism Organization (KTO), with support from the Korean Cultural Center (KCC) and Philippine KPop Committee, Inc. (PKCI), is presenting "Korea Travel Mart 2015‟ on Oct 24 (Saturday) and 25 (Sunday) at the Activity Center, Glorietta, Makati City. Participating airlines include Korean Air, Asiana Airlines, Cathay Pacific Airways, Jeju Air, Cebu Pacific Air and Air Asia Zest and travel agencies. 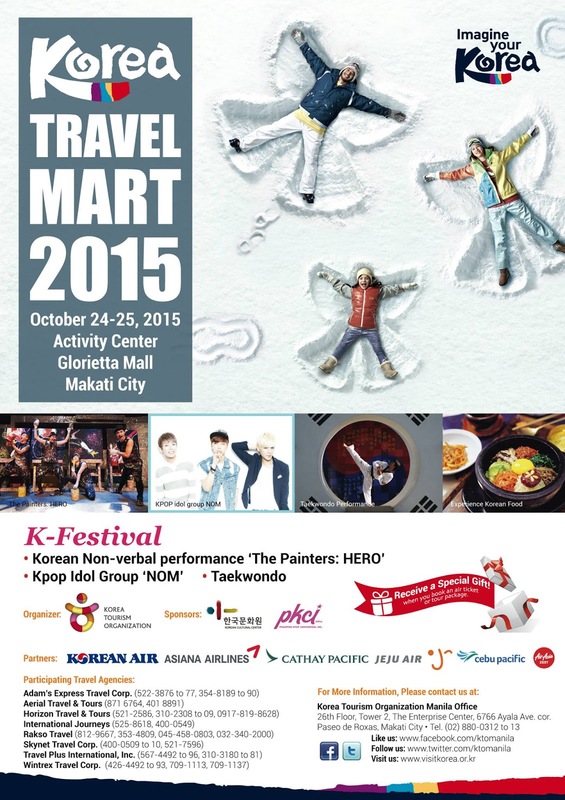 The Korea Travel Mart will be featuring booths showing the best of what Korea has to offer. It's the perfect opportunity to check out the best deals and the most interesting tours in and around Korea. Travel agents will be on hand to assist you in your tour requirements. Travel to Korea Zone find autumn and winter packages as prepared by airlines and travel agencies. If you have a specific destination in mind, they can also customize a tour for you and give free consultation. Autumn(Sept-Nov) is the perfect time to visit because of the mild climate. However, should you want to experience freezing weather, visit Korea during winter(Nov-Feb), you can still enjoy it by visiting their Ski Resorts where you can enjoy skiing, snowboarding, ice skating and playing with the heavenly snow . Imagine your Korea Zone will provide Korea travel information you need for your grand vacation. KTO will be having a Facebook like event in which you can get Korea Travel Kit and other freebies if you like its page. You can also ask about the visa guidelines and tips on how to make your trip a memorable one. In this zone, you can also redeem your special gift from KTO if you purchase air tickets or packages from the participating airlines or travel agencies during the Korea Travel Mart 2015. K-Culture: Hallyu Zone you will surely enjoy this zone as we will feature various display of KPOP Star standees perfect for selfies or groufies. You can begin experiencing your Korean cultural experience right at the Travel Mart by donning their traditional costume, Hanbok and prepare your taste buds to Korean Cuisines Bibimbap and Kimbap. K-Performances catch The Painters Hero as they will be performing in this event. The Painters HERO is an innovative art performance that stages the mind-blowing skills of live drawing with incredible visual effects filled with a witty blend of mime, dance, and comedy right before your eyes. The entertainers line-up doesn't stop there, K-pop Idol group NOM or also known as “No Other Man” will perform for everyone. You will also get a chance to be close with your idols as they will also be having a fansign event. Watch the breathtaking performance of the Taekwondo team. Feel the KPOP vibe with the hottest K-Pop cover dance group that will hype up the event and get ready with your best K-Pop outfit as there will be a K-Pop dance lessons. This event offers an opportunity for us Filipinos to make Korea Tour a truly memorable one. Save the dates to shop for your dream vacation at Korea Travel Mart 2015‟ on Oct 24 and 25 at the Activity Center, Glorietta, Makati City.